Andrew Cartwright of Great Bowden Recital Trust and Matt Hankins of MH Music handing over the new PA equipment. 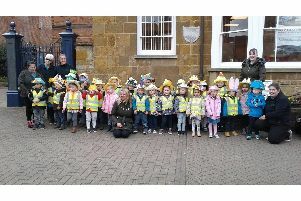 A Harborough-area musical group has thanked a trio of generous organisations which provided grants to help them buy new equipment. The Great Bowden Recital Trust is in its 12th year and when it began it held three recitals a year. The group now has more than 300 members involved in 200 rehearsals a year. Money the group raises is given to young people in the Harborough area who cannot afford music lessons. The group received donations from the Harborough and the Bowdens Charity, Market Harborough Building Society Charitable Foundation and Rotary Swimarathon and worked with Matt Hankins of MH Music to buy kit which will not need to be replaced for 10 years.